A place out of time, Ashaunt Point - a tiny finger of land jutting into Buzzards Bay, Massachusetts - has provided sanctuary and anchored life for generations of the Porter family, who summer along its remote, rocky shore. But in 1942, the U.S. Army arrives on the Point, bringing havoc and change. That summer, the two older Porter girls - teenagers Helen and Dossie - run wild. The children's Scottish nurse, Bea, falls in love. And youngest daughter Janie is entangled in an incident that cuts the season short and haunts the family for years to come. As the decades pass, Helen and then her son Charlie return to the Point, seeking refuge from the chaos of rapidly changing times. But Ashaunt is not entirely removed from events unfolding beyond its borders. Neither Charlie nor his mother can escape the long shadow of history - Vietnam, the bitterly disputed real estate development of the Point, economic misfortune, illness, and tragedy. On the stillest, emptiest days, you can almost but not quite imagine the place when it was lived on by its earliest people, the trapping and fishing, tying and smashing, the waves the same, the rocky beaches too, but no army base, no bisecting road or fighter planes up from Otis Air Force Base, Code Red. No houses unheated, built for summer, or mansions with heat, Wi-Fi and central air. No blinking eye on a metal gate (no gate). Neither headstones nor written alphabet. Later: Here Lies John Cornell. Here Lies Tabitha Brown. Here, a stone fishing weir at the foot of the creek. Here, a summer wetu; inside, a woman labors upright, giving birth. Did they dunk the baby in the creek, wrap him in a new red blanket, dress him, as he grew, in a pair of woolen breeches? One year, they had to find another place to grow him into a man. A deed appointed to be recorded. New Plymouth. November the 29th 1652. The End of the Point begins with an epigraph from William Starr Dana's Plants and Their Children. How does this quote set the tone for the novel? How does it reflect the story's themes? The novel is told through three main points of view - Bea's, Helen's, and Charlie's?over a period of more than fifty years. What does each perspective and timeframe bring to the story? What would the book lose or gain if the author had set it in one era and/or followed a single character's perspective? The End of the Point is poetic and profound. Again and again, Graver's characters either articulate or exemplify the idea that, whether they understand why or how, it's only at Ashaunt Point that they are truly themselves at their most authentic, largely removed from the dramas that might characterize the rest of their lives. Readers will likely come away from Graver's novel reflecting on the special places in their own lives, longing to reconnect with or revisit them, to introduce their meaning and beauty to new generations. (Reviewed by Norah Piehl). Eloquent ….Graver’s engaging, expansive storytelling allows us to take up residence inside the minds of a host of different characters, watching as they create their own pictures of the world around them, as they invest certain places and people with mythic significance. With her fourth and most emotionally textured novel, Graver proves herself a master chronicler of the ever-spiraling human comedy. The End of the Point is a work of uncommon gracefulness, as much in its boundless empathy as in the luminosity of its prose. Graver is incredibly good at evoking past, present, and future, and the ways in which they intersect..her control of time, her ability to evoke place and define character - are immense. Starred Review. A lovely family portrait: elegiac yet contemporary, formal yet intimate. Starred Review. With a style and voice reminiscent of William Trevor and Graham Swift, Graver's powerfully evocative portrait of a family strained by events both large and small celebrates the indelible influence certain places can exert over the people who love them. The End of the Point is intimate and rich and compelling, a sprawling saga that evokes both the wildness and fragility of the New England coast. Elizabeth Graver is an uncommonly fine writer: dancingly in command of language, yet always, foremost, faithful to something quieter and more essential - call it the complexities of truth. The ambitious scope of her new novel is beautifully matched by her largeness of spirit. I would read anything this author writes. Is it possible for a novel to be at once cunning and magnificent, epic and compressed, topical and timeless? Yes, yes, yes, in the case of Elizabeth Graver's gorgeous The End of the Point. Elizabeth Graver's novel is set on a (fictional) point jutting out into Buzzards Bay, which borders Massachusetts and is tucked in between the southwest coast of Cape Cod, Plymouth and Bristol Counties on the mainland. 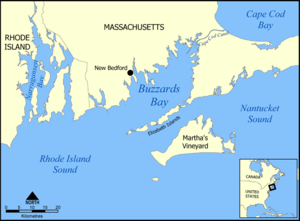 New Bedford, which was the world's leading whaling port in the nineteenth century, is the most major city on the bay.